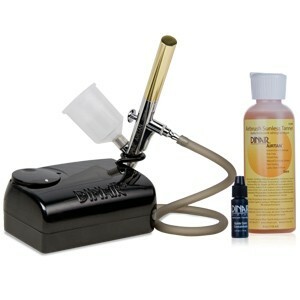 Do your own airbrush tan with the best results. Dinair has developed AIRTAN™ a streak-free, natural-looking golden tan that looks like a real tan and fades like a real tan without exposing yourself to hours of damaging UV rays which can cause burning, premature aging and even skin cancer. AIRTAN™ applies easily and evenly, absorbs quickly and dries in less than 5 minutes. You see the temporary tan color appear as you spray. It will not rub off on clothes or bed sheets. The final effect will last up to ten days as the skin slowly exfoliates off the dead skin tissue. The Dinair AIRTAN™ is a “feel good” product that allows you to wear what you want, when you want! Dinair AIRTAN™ WILL GIVE YOU INSTANT BEAUTY all year round!